Dog hand signals is yet another great way to teach your Miniature Schnauzer commands. Since dogs understand gestures and body language better than spoken word, training a dog to pay attention to hand cues is not that hard. 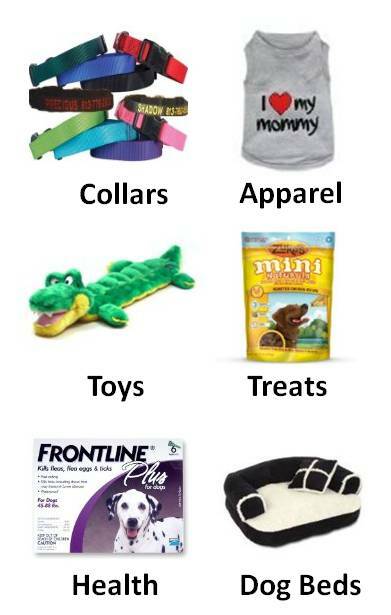 Plus it is especially helpful if you or your dog is deaf. 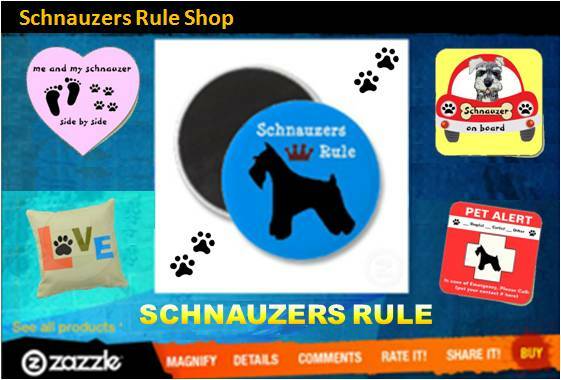 Although you can train your dog to respond to any cue you wish, Schnauzers Rule has put together an easy-to-train picture and description guide and tutorial below to show you how it's done. Dog Hand Signal for SIT: Teach your dog to SIT by using a quick flip motion of your hand from palm facing down to palm facing up. With your Miniature Schnauzer in front of you and a piece of kibble in your hand by your side, bring your arm up to a 45 degree angle, with your palm facing downward. Next flip your palm up and move your hand slightly over your dog’s head. Because your Schnauzer is following your hand holding the kibble, his bottom will hit the floor. As soon as he sits also use the verbal command SIT and reward him with the kibble. Continue to practice using verbal cue and gesture for 3 times. On the fourth time do not say SIT, just use the hand signal only and your dog should comply. Alternate times you offer a treat reward so your dog learning to respond to the hand signal and not just to get the reward. 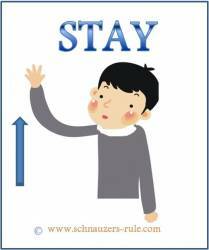 Dog Hand Signal for STAY : Teach your dog to STAY by raising your arm up straight and palm facing forward. Once your Schnauzer is in the SIT position, hold your palm in front of his face and say STAY and take one step back. If your dog does not move go back to him and give him a treat reward. Start again but this time take 2 steps back. If your Schnauzer still does not move, go back and reward him again. Now go 5 feet away and raise your arm up with your palm facing your Schnauzer and say STAY. Wait for a count of three and if your dog does not move, go to him and hand him his reward. Next time take a few steps away from your dog and give the hand signal only (ie do not say stay) walk a few more steps away and show the gesture once more. Wait for a count of 5 and if your Schnauzer remained in the Stay position, go back to him and say good stay and give him a well deserve treat. Dog Hand Signal for COME : Teach your dog to COME by using a sweeping motion with your right arm going across your chest to your left shoulder. Have your Miniature Schnauzer in front of you and at least 3 feet away. Next, with your hand by your side, show your dog that you are holding a piece of kibble in between your index finger and thumb. 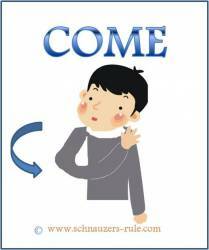 Next sweep your arm across to your opposite shoulder and say COME, and at that exact moment take one step back. Once your Schnauzer comes towards your praise and reward him with the treat and begin again. Repeat the steps above for 3 more times. If your dog successfully complies, on the fourth time do not say COME. Just use the hand command and reward your dog when he complies. Dog Hand Signal for DOWN : Teach your dog to lie DOWN by bringing your arm straight down, pointing to the floor. Have your Miniature Schnauzer sit in front of you. With a piece of kibble in your hand, slowly squat down while lowering your arm towards the floor. Say DOWN while passing the kibble in front of your Schnauzer's nose. One he goes DOWN praise and reward him. If your Schnauzer does not go DOWN, while you are in the squatting position, place the kibble up under your leg and as soon as your Schnauzer goes down to get it say DOWN and then reward. 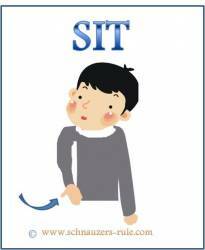 Continue the entire process from a sit to down position for 5 times. Be sure to use the down command and treat reward to mark the successful action. On the sixth attempt, do not use the verbal cue. 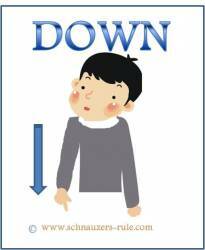 Just motion your dog to the down position and treat when he complies. Dog Hand Signal for HEEL : Teach your dog to HEEL or walk nicely next to you by using a lowered arm motion and a pat to your leg or hip. In an open area of a large room or outside, begin by slowly walking around with a treat in your hand and your arm lowered to your side. 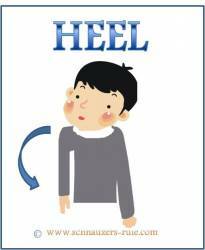 Lightly pat your hip or upper thigh and say HEEL. Your Miniature Schnauzer will follow you closely to get to the treat. This one will take some practice so plan on having lots of treats available. You can also teach this command on leash, too. After several successful heel positions have been achieved, step 2 feet away from your dog and tap your hip. Your dog will assume the heel position for his reward. Training should be reinforced throughout your dog’s life! "Knowledge Share"... If you found this page on Training Dogs Hand Signals helpful and informative, please share it with your dog-loving friends by clicking on one of the share links (like facebook, twitter, and google +1) located at the top right or bottom of this page.